Aside from long-distance transportation, out-of-season crops are harvested early, refrigerated, artificially ripened, and left in bins at the grocery store for days, sometimes weeks. All of these factors, especially the cooling and heating, change the flavor and nutrient content of the produce. It’s not just the experience that makes a trip to the farmer’s market or your personal garden taste better, the freshness and handling actually affects how it tastes! It goes without saying, if it tastes better, we are likely to eat more of it. Yummier fruits and veggies equates to eating more fruits and veggies. You can’t lose there! Peak season produce is cheaper for the farmer to grow, store, and distribute, and this leads to lower costs being passed down to the consumer. Say hello to low prices! It supports your body’s seasonal needs! Peak produce is closely aligned with our bodies’ nutritional needs. In the heat of summer, we are most in need of hydration and cooler foods, such as berries and cucumbers. Conversely, winter offers citrus fruits packed with Vitamin C to boost immune function and equip us against getting sick. During the Spring, leafy greens are abundant to aid in detoxification from the bulk season of heavier foods. Do you see the trend here? Our bodies are aware of its needs, but it is our responsibility to answer to those needs. 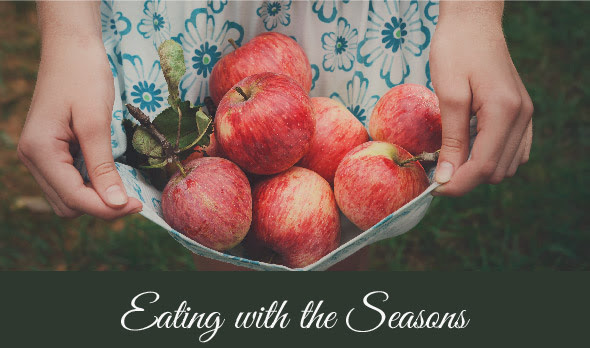 Eating seasonally does just that! Depending on your geographic location, different fruits and vegetables are available to you throughout the year, and deciphering between in-season produce and those that have traveled from thousands of miles away is easier than you may think.